Check out our FAQ page before emailing us for quick answers to most questions. Please fill out the form below. We will get in contact with you as soon as possible, generally within 48 business hours. Alvorens contact met ons op te nemen kunt u kijken of uw vraag reeds gesteld en beantwoord is op onze FAQ pagina. Vul onderstaande formulier in en we nemen zo snel mogelijk contact met u op, op werkdagen binnen maximaal 48 uur. 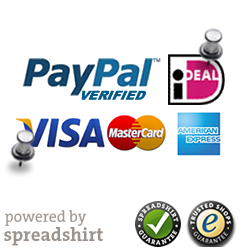 “We Are Alike” has partnered with industry leader Spreadshirt to fulfill our online orders using vibrant, durable on-demand printing methods and comfortable garments from well-known brands like American Apparel, Bella+Canvas, Gildan and more. This partnership allows us to keep our prices low and the quality high. More importantly, it allows us to do less work and take more naps. If you have questions about an order you’ve already placed, please call the Spreadshirt customer service team at +31 30 3100057 (Mon-Fri, 9am-8pm CET). Have your order number handy so they can easily help you.